This is a professional level product suitable for use by surveyors and architects working on residential projects. Because it uses Visio and custom “SmartShapes” it is much easier to use and can produce far more attractive, colorful and persuasive drawings. Any homeowner, property developer or builder can now draw their own accurate site plans to study zoning restrictions, development potential, and any number of schemes for renovation of, and additions to, a property. The Survey you draw, plus any number of Site Plan Schemes are each stored in separate overlay pages within a single Visio vsd file. 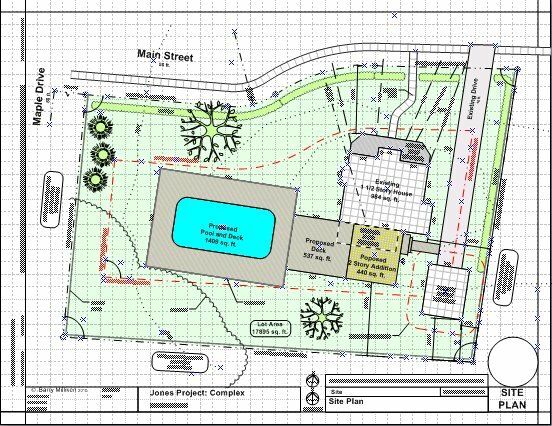 visiSitePlan comes with a drawing template, a tutorial, sample drawings and 4 stencils containing tools for drawing Surveys and Site Plan Designs. Apply the power of Visio smart shapes and templates to Home Planning and Design at a level not seen before. Provide professional level design and drawing software for architects, surveyors and engineers, but which is far more efficient and cost effective than AutoCad. 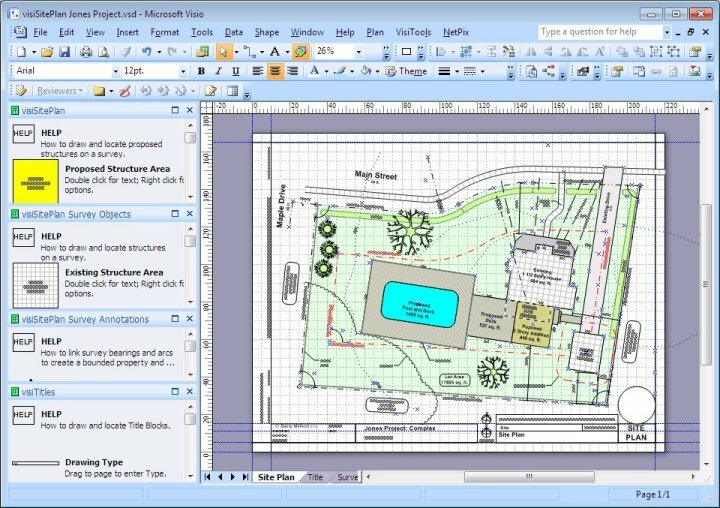 Provide anyone with Visio skills to easily participate in Home Site Planning and Design. visiSitePlan is the first module in a series of applications that will address all phases of the architectural design process that require the production of 2 dimensional drawings: from Site Planning through to final Construction Drawings. This software will not work the Standard version of Visio. You must have Visio 2003 or later WITH the AEC (Architecture, Engineering, Construction) components. In the 2003 release this version was called “Visio Technical”. For Visio 2007 and 2010 you need the Professional version that contains the AEC stencils. 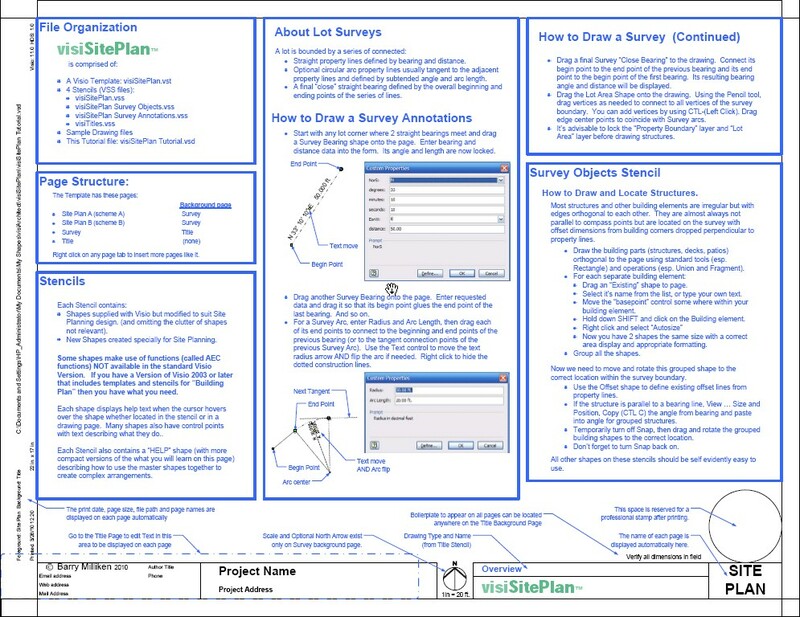 NOTE: The "visiSitePlan Survey Objects" stencil provides shapes with a choice of fill patterns. In Visio 2013, the "Concrete" fill pattern can cause performance issues so it is necessary to substitute one of Visio's standard fill patterns for the architecturally styled Concrete in this product when used with Visio 2013.